Green manuring is a routine with regards to furrowing or transforming into soil undecomposed green plant material to improve physical structure and also the strength of the dirt. It expands the accessibility of plant supplements that add to the yield of the product. The microbial activities are enhanced as the fresh organic material acts as the nutrient source for the diverse soil flora and fauna. The structure of heavy, light and sandy soil is considerably improved and unproductive lands can be converted into fertile ones by green manuring. In hilly areas, green manuring prevents soil erosion on sloppy lands by providing very good soil cover. Green manure crops are quick growing legumes and grasses that are ploughed into the field, mulched on the top of the soil and used as a composting material. Amongst the green manure crops, sunn hemp and dhaincha are outstanding in biomass production. It is essential that there should be sufficient moisture in the soil when the green manure crops are ploughed into the soil to facilitate the microbial activity. Farmers with small holdings and who cannot afford to lose a season for the cultivation of green manure crops can undertake green leaf manuring. It is a process wherein the green leaves, tender green twigs collected from shrubs and trees grown on bunds, wastelands and nearby forest are ploughed into the soil. The common shrubs and trees used are gliricidia (Gliricidia maculata), subabool (Leucaena leucocephala), Acacia sp., etc. that are locally available in the region. Why Green manure is important? It stabilises soil pH.Because sunhemp, dhaincha, moth bean |(/pilli pesara/ madike kaalu/ matki) etc legume family plants will grow without any trouble in alkaline & acidic soils. They have deep roots and they bring nutrients from the deep soil. We don't need to wait for 2-3 years for soil to become fertile.If we mix them as green manure in the soil they help to develop microbes by neutralising soil ph. Then you can spray organic liquid manures without any doubt and in turn makes soil fertile and ready for farming any crop. 1. COWPEA: Cowpea is one of the important leguminous green leaf manure crops. As this plant is easily decomposable and very well suited for green manure purpose. June-July months are best suited for the sowing of this manure. Even though it is being cultivated in summer months ( March to April). Use of effective Rhizobium bacteria increases the fixation of nitrogen up to 40 kg/ha. 2.SUNNHEMP (Crotalaria juncea): Sunhemp cant grows in waterlogged soils. It loves to grow in loamy soils in all seasons.It yields around 13-15 tons of green compost per ha and requires a seed rate of 25-40 kg/ha. Utilization of compelling Rhizobium strain with seeds settles the Nitrogen 1 kg/day. 2. DHAINCHA (SESBANIA ACULEATA): Dhaincha is reasonable for loamy and clayey soils. It is genuinely impervious to dry season and in addition stagnation of water. It develops well even in base soils and controls alkalinity if developed more than once for 4-5 years. The roots have a lot of knobs. It yields around 10-15 tons of green compost per ha and requires a seed rate of 30-40 kg/ha. Utilization of compelling Rhizobium strain with seeds settles the Nitrogen 1 kg/day. 3.WILD BEAN/PILLIPESARA (PHASEOLUS TRILOBUS): This is a dual purpose crop yielding good fodder for the cattle and green manure. Pillipesara comes up well in hot season with sufficient soil moisture. Loamy or clayey soils are best suited. After taking one or two cuttings for fodder or light grazing by animals, the crop can be incorporated into the soil. 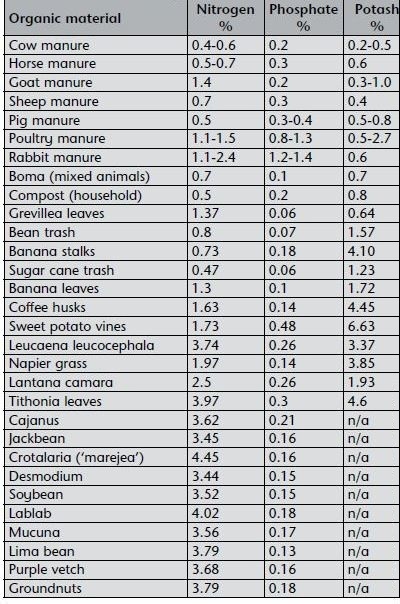 About 5-8 tonnes of manure can be obtained from one ha. All these are suitable for clay / loamy soils. In some parts, chickpea and horse gram are used for green manure. Horse gram is most preferred. Sesame and soya stalks are rich in calcium phosphate. If we incorporate it in green manure.we get dual effect calcium + Phosphorus. Nitrogen is a fundamental supplement required by plants however which is effortlessly lost when the dirt is inadequately overseen. In practical agribusiness, green manure or cover crops play a noteworthy part in enhancing soil richness and farm profitability. This sort of fertilizer alludes to crops or plants that are developed in between the rows of the main crop to give soil cover and to enhance the nature of the dirt. This is particularly vital among minor scale farmers who think that its costly to purchase mineral manures. Utilizing green manure crops like lablab and velvet bean, it is conceivable to guarantee a satisfactory supply of good amounts of nitrogen into the dirt. This is through nitrogen fixing ability in the underlying foundations(roots) of these nitrogen-fixing crops. At the point when furrowed again into the dirt, the legumes guarantee nitrogen and different supplements, that are reused (returned) into the dirt. The supplements are discharged gradually to the dirt as the dead plants decompose. Since legumes develop quick, they gather a ton of biomass in a short span of time. They can build plant supplements in the dirt, in particular, nitrogen through natural nitrogen-fixing and in this way enhance farm yields. These will limit soil erosion by diminishing the effect of rain on the dirt. They suffocate and slaughter weeds even the damaging ones like Parthenium, in this way slashing costs for weed control. They also play an essential role in generating fodder for livestock. Studies led in Kenya by the Legume Research Network demonstrate that green manure when utilized with yard compost spare agriculturists the cost of purchasing compound manures. The table underneath can enable farmers to pick the best green manure. 9 Ways Of Weed Management.